If you’ve taken a solemn vow — as I did when I was a knee-high bambino — to eat as much Italian food as your piggy bank can muster, you know that savvy restaurateurs can shoehorn Italian restaurants into some truly funky spaces. Find yourself a semi-operable gas burner, a fridge to keep the Parmesan fresh and a larder stocked with enough olive oil to coat a couple of sauté pans, and you have yourself the foundation of a neighborhood trattoria. Mansions. Pantries. Monasteries. Basements. I thought I’d seen it all, until we pulled up to the corner of Merrill Street and Green Bay Road in Winnetka and laid our eyes on a true first: an Italian restaurant (and a classy one at that), Mino’s, nestled cozily inside the shell of a former auto-body repair shop. I’m told by my friends in the design world that an appropriate term for a rehab of this kind is an “adaptive reuse project” or “restaurant conversion.” But after slipping into our white leather booth and letting the space wash over us — snow-white walls, dark stained woods, huge nature-inspired murals by local artist Alice Hargrave — the only thing that kept running through my mind was that old cartoon of Cinderella’s fairy godmother turning a giant pumpkin into a glittering carriage. In this case the fairy godmother in question is Audrey Fosse, who spent the last 18 months with her husband, Eric, and business partner, Glen Deutsch, dealing with more drywall and concrete issues than a month’s worth of This Old House reruns. 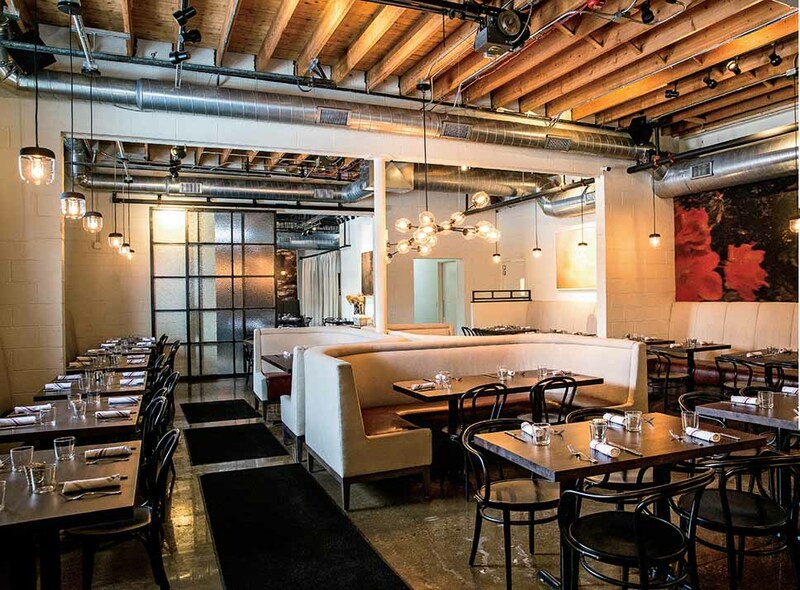 Somehow they’ve preserved the historic charm of the place — concrete floors, exposed industrialchic ductwork and giant sliding doors that welcome in summer’s best breezes — while creating the feel of a modern-day trattoria. Chef John Korycki’s menu aims straight for that cozy, grassy-green fairway in the middle of the Italian table. No slithery organ meats. No fermented fish sauces from the age of Caesar. And no postmodern pasta-wrapped meatballs wading in a Romano-cheese brodo. This is simple down-the-middle fare that benefits from smart riffs on storied staples. It’s rare, for instance, to find a fritto misto platter that’s equally light and KFC-crispy. The secret? 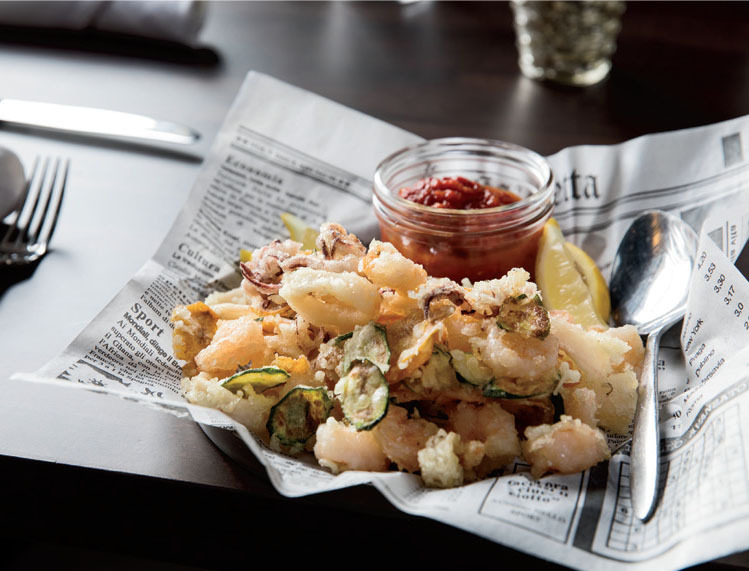 Gluten-free cornstarch and sparkling water, which produces a delicate second skin around the calamari and shrimp that doesn’t parka the seafood in those doughy coatings that so often doom dishes like this. 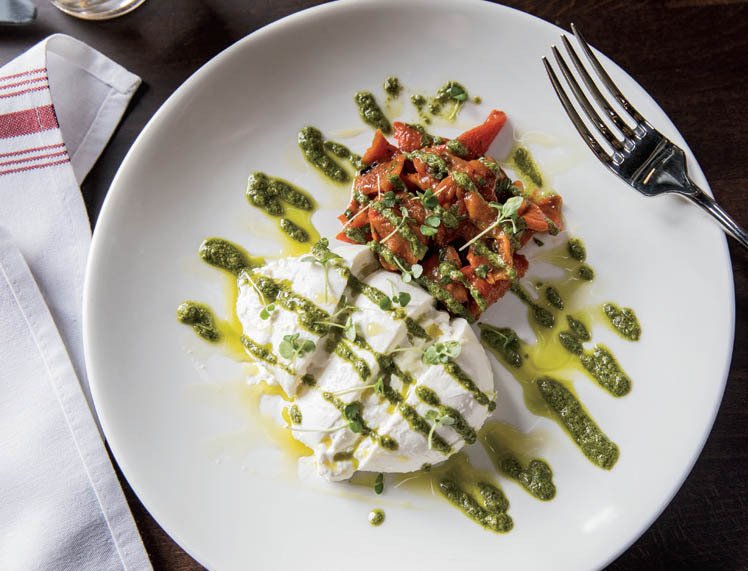 It’s a fun starter, as is the kitchen’s take on burrata, which is drizzled with a verdant gloss of pesto and nested with sweet peppers. The result is so buttery it’s impossible not to smear it on the accompanying toast points and pretend you’re a viscount for the day. If anything the menu shines brightest with the lighter fare, like the house crudo, which changes daily. Our selection included glistening slices of kampachi — think premium amberjack — that’s marinated in an aperol-esque blood orange jus with sweet fennel, a tapenade and thin cuts of serrano peppers. It’s Sicily on a plate. Korycki’s menu will please budget-conscious guests as well as those interested in splurging a bit. One could easily make a nice meal, for instance, out of a glass of wine and bowl of pasta, the best of which is a tagliatelle Bolognese teeming with prosciutto, pancetta and beef. Or perhaps a beer and one of the house’s generously sized thin-crust pizzas, also available for takeout. This flexibility has proven magnetic to a wide swath of diners. You’re as likely to see Bob Berger, the former owner of Hubbard Woods Motors that once stood on this site for decades, congregating with his old mechanics as romantic partners savoring seafood and sipping cocktails, the latter of which includes the Li-mona, a refreshing mix of vodka, elderflower liquor and homemade limoncello. The entrée list plays things safe, but note the attention to details. A large plank of salmon with a red wine reduction is classic, but the kitchen takes its time with the spinach, blanching away any potentially earthy notes and spritzing them with just the right amount of lemon. Ditto for the house’s sirloin: tender, affordable and cooked perfectly on the house’s wood-burning grill. The accompanying flavors have the balance of an Olympic figure skater. Citrus-drenched arugula meets sweet caramelized onions. It hits all the right notes, as does an absolutely dynamite olive oil cake. Add some excellent service and you have all the proof you need that 985 Green Bay Road remains a darn fine place to park your car. Mino’s is located at 985 Green Bay Road in Winnetka, 847-386-6053, minositalian.com.